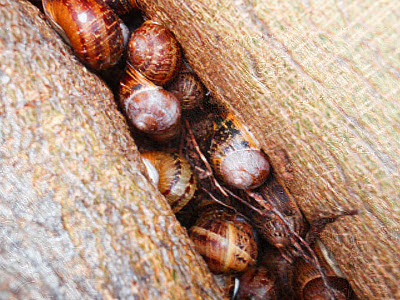 Brown garden snails (Cantareus aspersus/Cornu aspersum) in a hibernaculum - Irvine, California. for hybernation during prolonged periods of inclement weather. Gardeners, what do you do when you see a population of snails in a hibernaculum? Last year I got the chance to get really close to another angel's trumpet, the Brugmansia sanguinea. The term sanguinea which is derived from the Latin word for blood (sanguis) describes the color of the corolla tube. 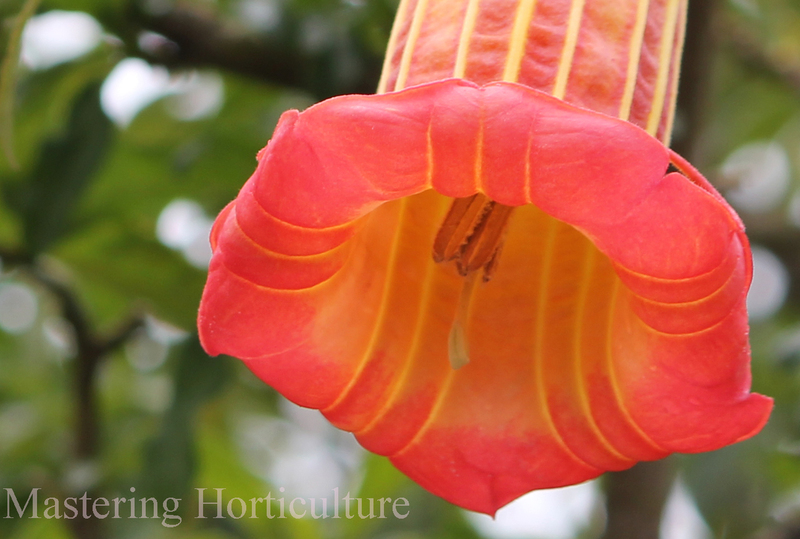 The color red distinguishes this plant from the species within the genus Brugmansia. These are the seven known species of Brugmansia according to the International Brugmansia and Datura Society: Brugmansia arborea; Brugmansia aurea; Brugmansia insignis; Brugmansia sanguinea; Brugmansia suaveolens; Brugmansia versicolor; and Brugmansia vulcanicola. They are native to South America along the Andes Mountains from Colombia to Chile. The flowers in the pictures here were all taken in Bogota, Colombia. 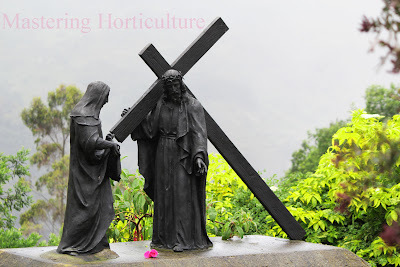 (My family visited one of the tourist attractions in Bogota - the Mount Montserrate which can be reached by an aerial tramway or a funicular.) To give you an idea of environment there - Bogota is located somewhere along the equator with an elevation of about 10,300+ ft. above sea level. The place is in the tropics but it feels like San Francisco, California. Also, because it is located along the equator, the daylength is always the same throughout the year. In other words the climate there is unexpectedly and consistently mild. Fig. 4 Brugmansia sanguinea flowers are used as some sort of offering. Toxic Angel. The pendant flowers of the Brugmansia (Angel's Trumpet) are delightfully inviting but never forget that the plant is deadly. I have warned readers about the toxic contents of Brugmansia a while back. 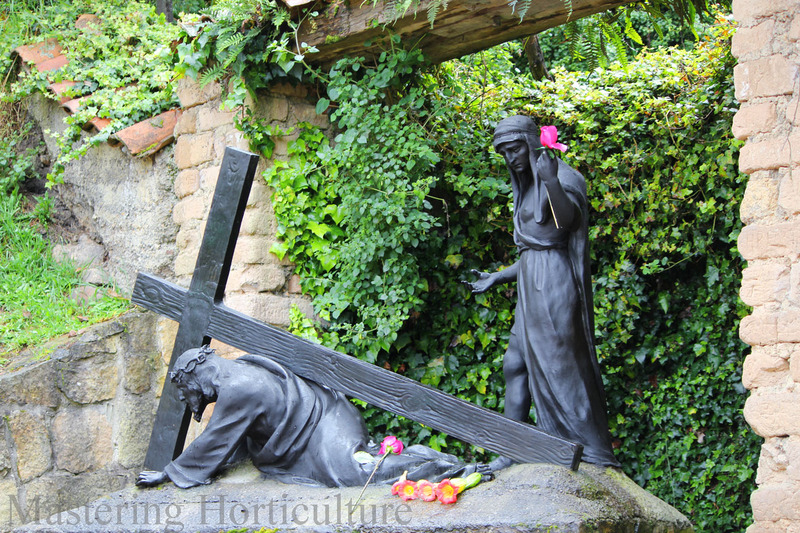 I was shocked (not because of propriety but of safely) to see some pilgrims visiting the church at the top of Montserrate, pick these flowers from the surrounding gardens and lay them down at the different stations of the cross (Fig.4). Cursed Devil. 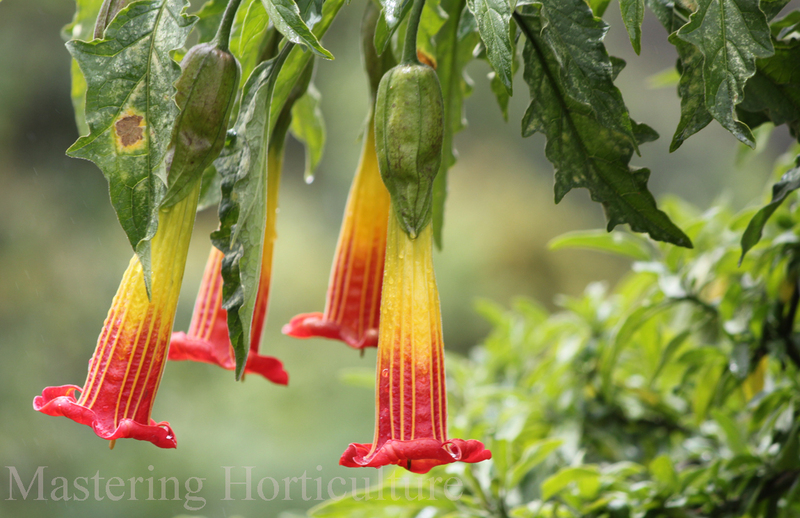 While Brugmansia is considered an angel (as in Angel's trumpet), she has a cousin who has fallen into the dark side. Datura, aka Devil's Trumpet, is so closely related to Brugmansia that formerly they were classified under the same genus. That has changed. 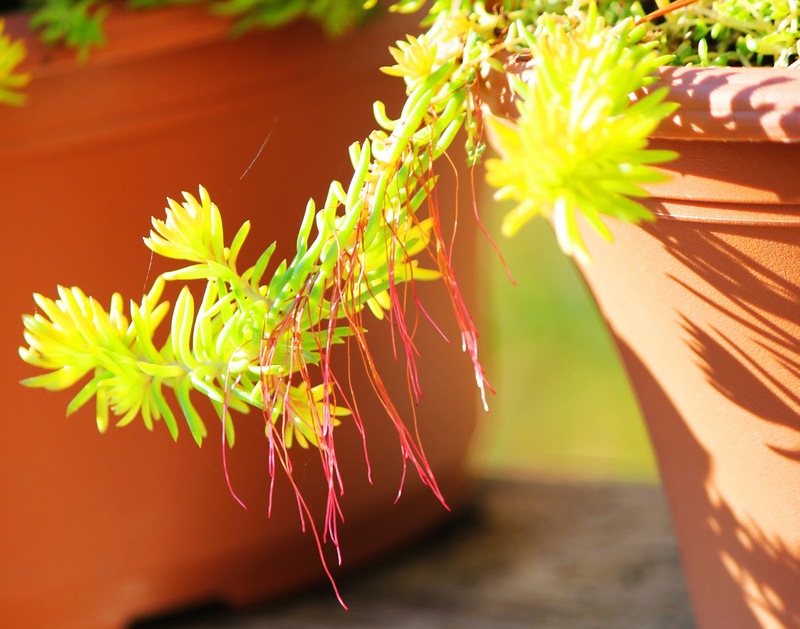 These two relatives can be identified from each other, firstly, by the position of their flowers. Angel's trumpet hangs like pendant looking down to earth (Fig. 1) while Devil's Trumpet, looks up to the heavens as if asking forgiveness. As the story goes, the devil was once an angel himself. 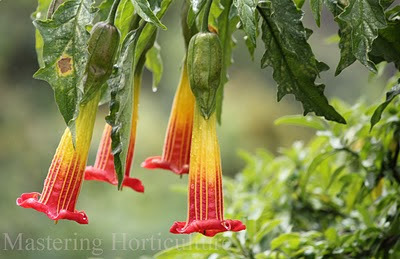 Secondly, Brugmansia is a woody plant (in a tree) while Datura is often an annual (herbaceous) and sometimes, depending on species and growing conditions, a short-lived perennial. It is well established that Datura, just like Brugmansia, is highly poisonous. Careful handling of this plant is highly recommended. At 10,300+ ft elevation, Mount Montserrate has a tropical yet mild climate. I've heard a European shepherd once say that it is alright to have wolves around his flock as long as he sees the wolves first before they see him. The problem is when the wolves see him first - then it is too late. Likewise, it better to know the dangers Brugmansia has before it tells you so. 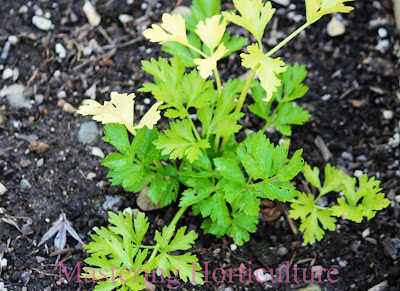 Profuse adventitious-rooting allows one plant to adapt under extremely dry conditons. May your roots be prevalent and deep. So that you may prosper in all circumstances.